I particularly love holidays because I can eat whatever I want, including potato-leek soup for breakfast. 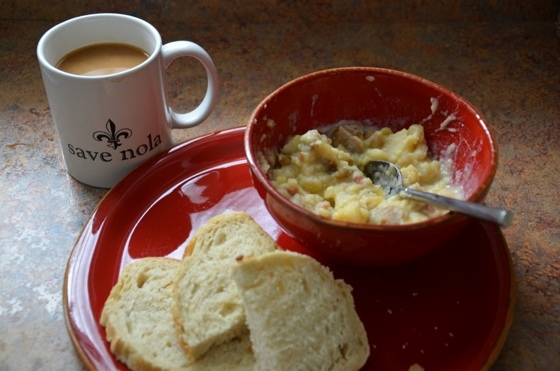 With a hint of snow on the ground this morning, it just seemed perfect to eat potato soup and knit. This afternoon we are headed to celebrate Christmas with my family. Even though I had a few extra days to prepare, I am still feverishly trying to finish some handmade gifts! This entry was posted in Food and Drink, Holiday by Ashley. Bookmark the permalink. When will you make corn chowder next? Did you freeze extra potato leek soup? have you gotten any dishes from Anthro lately?